Q. My professor said there are materials on reserve at the library for my class. Where are they? If your professor has placed materials on reserve at the library, come to the Circulation Desk with the title of the material you are seeking and either the instructor’s name, course name, or course number. It is often very helpful for circulation staff to check your syllabus for the information needed to locate your course reserve. Reserves can be checked out for a set period of time, typically 2 hours, for library use only. This means that the material cannot leave the building. Unsure if your professor has placed a book on reserve? Head to the Course Reserves page, and click the All print reserves link. This will direct you to a catalog that allows you to search by instructor’s name, course name, or course number. 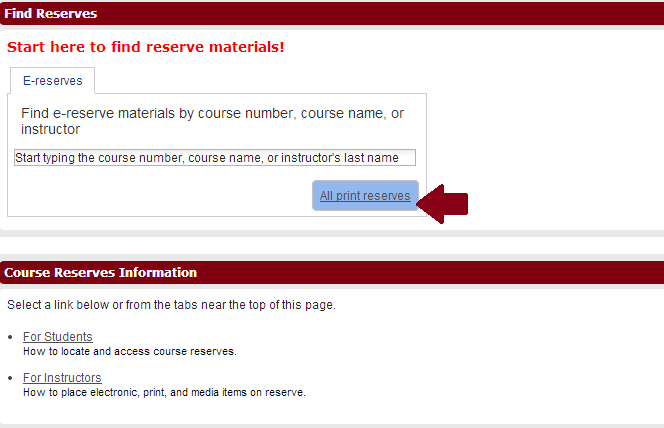 Once located, you will have access to a listing of courses the professor teaches, and with each course, the materials on reserve.